Grab a handful of bottles, put them in a box, continue until the box is full, close the box, tape the box, date stamp it and repeat. A bunch more times. Working in the beer industry might sound like a glamorous job, but the packaging side of it is sometimes the exact opposite. It’s a lot of repetitive motions and troubleshooting. 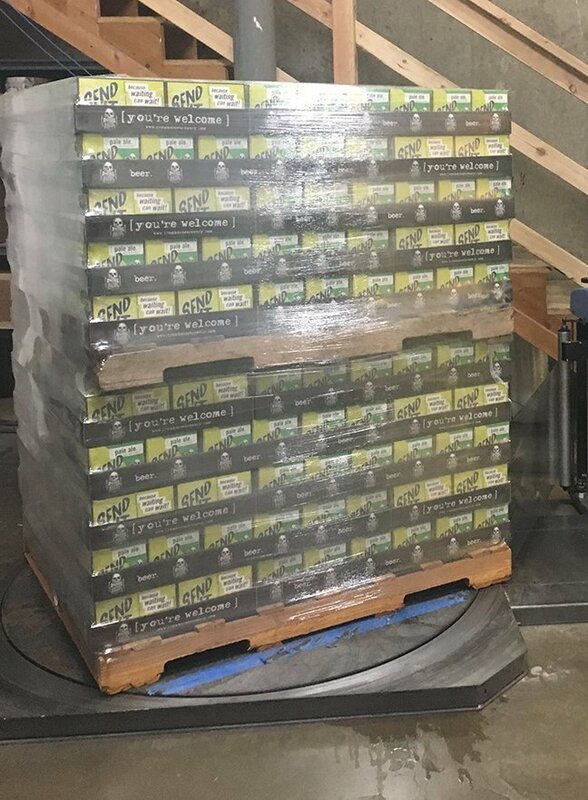 That being said, packaging is one of the most necessary tasks at the brewery and we want to make sure everyone knows how awesome our packaging team is. It’s how we get all of our delicious beer to you via kegs, bottles and cans. And it’s not just beer; packaging jobs are some of the most important jobs in our world today to enable the transport of foods and goods. According to Bureau of Labor Statistics, 392,910 people in the U.S. are employed in this profession, and of that 28,660 people are employed in the beverage manufacturing industry. There are a lot of parts that are automated but they still need folks to run the machines and troubleshoot them when something goes wrong. Our packaging team works five days a week (sometimes more depending on the beer schedule), and is able to package roughly: 120 cases of 22 ounce bottles per hour, 133 cases of 12 ounce cans per hour and 24 barrel kegs per hour. We have an average of 7,262.294 cases shipped per week, according to 2017 statistics that are mostly accurate. In 2017 we produced 23,903 barrels of beer, which equates to roughly 5,927,944 16 oz pints of beer. The job isn’t easy, and like every job there are parts of it that are not glitzy like waking up at 4:30 a.m. to be at work by 5 a.m. or having to troubleshoot a machine when it’s not working properly, but our team makes it happen every week. We couldn’t get the beer to you without them, so if you’re drinking a beer while reading this raise it up to them. She is heavy. She is red. She will be your friend. A fickle woman but affectionate. It puts our delicious nectar into ⅙ barrels and ½ barrels that are delivered to all of your favorite bars, restaurants and tap rooms. Once a keg is sanitized it is then hooked up to the kegger, where it takes roughly 130 seconds to fill up a ½ barrel keg. One machine that is always surprising. Always breaking, always comes through. She doesn’t break, just plays dead. One catcher, one pitcher, one dream. To bring about Irish Death to the masses and you will join the dream. The youngest of the three yet the most lovable. Gentle but has a fierce bite every now and then. The days may be long but the canner always delivers. Always. 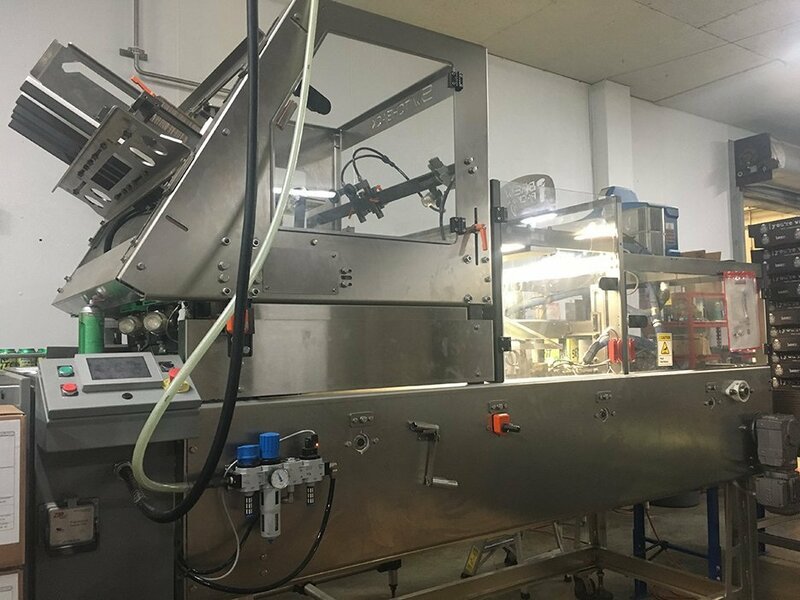 Our canning system has the ability to fill and seam 70 plus cans per minute or up to 175 cases per hour with its 10-head filler. We use this machine for both our 12-ounce cans and our 16-ounce Irish Death cans. The odd duck left out because the beer is already packaged by the time it hits this guy. This machine assembles boxes and pushes cans into them. Then we take them and stack them on pallets like you see below. 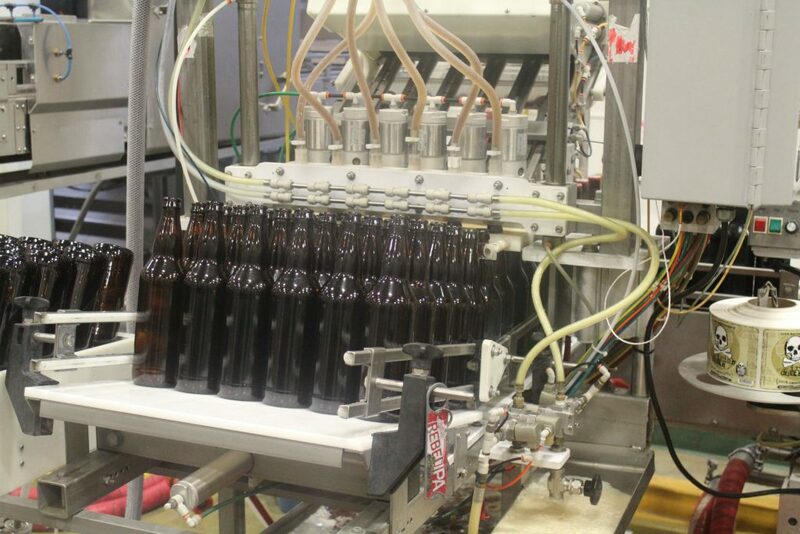 So there you have it, a look at the machines we use to package your beer. A testimonial from marketing that was written 11 months ago and sat in my Google Drive folder because I didn’t know what to do with it. I have what some call a cushy desk job in marketing. My chair is actually cushy, and it rolls around so if I have to talk to any of my cousins out in the marketing trailer I don’t even have to stand up. I can roll right over to them, further enabling my laziness. About 11 months ago I ventured out away from my chair, to learn more about what my cousins in packaging do on a day to day basis. I knew they put our beer in cans, bottles and kegs, but I wanted to really learn the how. How do all the shiny machines work? How do they troubleshoot when things aren’t going so smoothly? How do they handle waking up to be at work by 5 a.m. when most of us are still snoozing? And how HARD is it to have their job? You have to do things with the lines before you start kegging, like sanitize them and get everything all hooked up. I did not have to do that, but I did learn how the kegging process works. 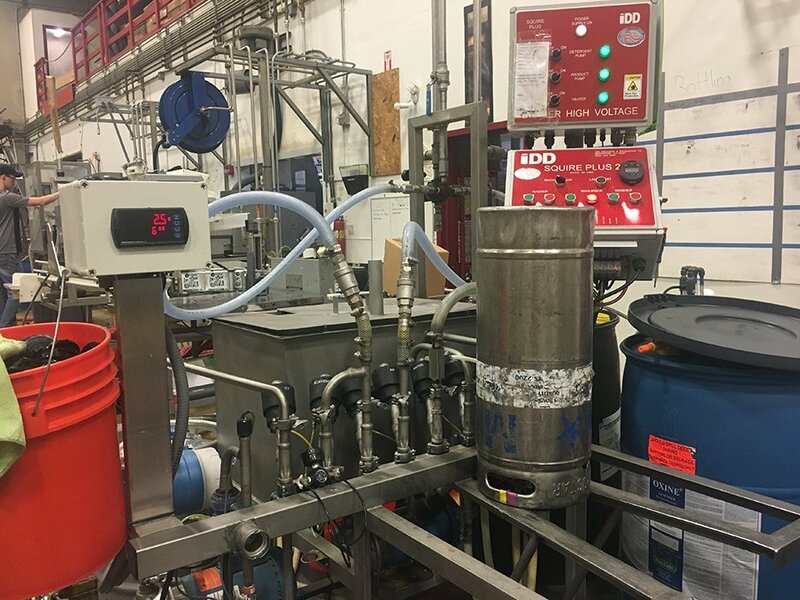 Josh H. gave me the 411 on how to tap the keg to the beer line and sani lines, how to push buttons to get the process started, and how to avoid a beer shower when untapping the kegs.The hardest part about that whole process kegging process is lifting the full kegs. Maybe if I worked in kegging for more than 20 minutes I’d develop the muscles to lift the 161 pound kegs. I jumped in on the bottler catching position to learn to “catch” the bottles, which means grabbing each 22 oz bottle, putting them in cases of 12, sealing the cases, date stamping them and stacking them in the correct way so they don’t all topple over. I felt exactly like Lucy in the “I Love Lucy” famous chocolate scene, except I did not start drinking the beers. The bottles would not slow down! And of course when I thought I was actually making progress, I would get the tape on the dispenser all jammed up or wonky. Eventually I got the hang of it, but you really have to keep moving. (Also I found out later that they turned the speed down for me so I could be somewhat successful.) Ok, so two hours later what did I learn? MAN THOSE GUYS (AND SOMETIMES GALS) HUSTLE THEIR BUTTS OFF! And you do feel it. My hands were sore from the bottle caps scraping against me as I grabbed them off the conveyor belt, and my back was messed up for 2 days afterward, I suspect from lifting the wrong way or just from the shock of the sudden amount of movement I added to my life (see first paragraph where I talked about laziness). I can see how those guys come up with solutions to make things better, because the only thing I was thinking about while doing all this was how can I be faster and more efficient? I have a whole new appreciation of the packaging team here after spending only 2 hours on the floor learning and working side by side with them. Thanks, guys, for making sure our beer gets put into packaging so people like me who sit behind a desk all day can crack open a cold one after a long day at the office.